Direct students to create a wiki or blog on which they can post responses to questions below. For options, see Technology Tidbits. Students should examine the cover of the play text. What is the dominant colour? What two symbols of authority are clearly visible? What do students think the title might refer to? Is it suggested by the image? This play is set the early 1970s, around 1971. Ask students to research the Australia of that period, to locate the play in its social and historical context. What were some of the differences between then now? Here are some possible focus points. No colour television (and obviously no internet, computers, mobile phones etc. ); what were the popular television shows at the time? Do any of them survive on Youtube? Watch the opening titles of Division 4. What was the biggest selling brand of car in Australia? How much did a new one cost? What was in fashion – hairstyles, clothing, etc.? What sort of music might the characters of this play have listened to? Two choices (included here as suggestions – there are countless others, of course!) Masters Apprentices ‘Turn up your Radio’ and Zoot ‘Eleanor Rigby’. Clips for both are available on YouTube; those wild seventies hairstyles might raise a giggle! Generate discussion around values and attitudes regarding social issues. Attitudes to women have changed significantly (although inequality is still an issue with regard to a range of attitudes, values and approaches in some instances). Other significant changes include, for example, the fact that homosexuality is no longer illegal (with Tasmania the last Australian state to decriminalise it in the 1990s); attitudes to indigenous questions such as land rights and recognition/reconciliation; and attitudes to the environment. These (apart from the feminism issue) are not directly connected to the play, but present for students the fact that the Australia of 1971 was a very different country to the one they have grown up in. Ask students to read the bio inside the front cover of the play text. The Removalists is one of his very early plays, only his second to be produced. Ask students to complete five-minute free writing exercises (they should write as much as possible in that time, without stopping) on the following topics. How is a play different to a novel or film? Is Australia a violent society? Give students a further 10 to 15 minutes to tidy up their initial response; they can edit (without removing too much), fix spelling and punctuation and so on. Divide the class into thirds. Allocate one topic to each third. Ask or choose three students from each third to share their responses, opening up the session for discussion afterwards. Each topic can then form the centre of a mindmap or similar, added to on a whiteboard or IWB by the teacher as responses/discussion points are raised. Students make note of anything they hadn’t covered or considered. This process should allow some of the core themes of the play, and the notion of play as text, to be explored in advance of reading the script. Language warning: There are several instances of swearing, including the c-word, especially in Act Two. This is a matter for teacher discretion: the language is in context for both the situation and the characters and so is relevant. Students should be forewarned, though, and contact with parents might also be advisable. Construct profiles of each of the characters as you read. This might include, but is not limited to, responses to the images of actors in the roles at the beginning of the text; highlighting/making note of dialogue that reveal motives or attitudes; and summaries of how each character evolves during the play. Develop character webs, to illustrate how each of the main characters relates to the others. The attached graphic organiser (PDF, 146KB) can be used as a template to help with this. You might include notes on such questions as: how do the characters know each other? Are they related? Do they like one another? Does their relationship change over the course of the play? How? Students can discuss specific lines from the play as exemplars of power, authority, manipulation etc. inherent in respective characters. Examples given under ‘Act One’ below. Students can keep a reading journal in which the exemplar questions below can be addressed. Since this is a play, it was intended to be heard and seen rather than read. Select some key scenes and appoint students to the roles; depending on time and student confidence, a simple representation of the set could be created in the classroom and students walk through the action, scripts in hand. As a rough guide I would suggest reading 10 to 15 pages per lesson; this should occur over approximately five lessons, depending on lesson length. Share the roles around if feasible, depending on the confidence and willingness of students. Consider each of these lines in their context in the play. What do they reveal about attitudes, power, relationships? How would you describe the relationship between the two sisters? Who has the power? Why? Read p. 51. What are your first impressions of Kenny? How does Williamson establish his character? How would you describe the role of The Removalist? Why is he in the play? Why does he keep referring to his ‘ten thousand dollars of machinery’? How would you describe the situation and dialogue on pages 76-77? There are elements of humour – Kenny’s sarcasm and so on. What role does this provide in the wider context of Act Two? Why is Simmonds angered by Kate’s adultery? What is Kate’s attitude to Simmonds as a result of this? The play effectively has a ‘double ending’; when Ross thinks he’s killed Kenny (p. 83-4), and when Kenny actually dies (p. 95). What dramatic possibilities does this create for Williamson? How does Ross attempt to cover his actions (p. 86-7)? What do these reveal about Ross’s character and his relationship with Simmonds as the play builds towards its ending? How would you summarise Fiona’s attitude to the events of Act Two? The ironic phrase ‘a few love pats’ is used a couple of times in Act Two, by Kenny and by Simmonds. Explain this phrase in the context of the play’s depictions of violence. Also a good opportunity to discuss Australian vernacular and our propensity for understatement. Discuss the ending of the play, with regard to Williamson’s phrase ‘a frenzied ritual of exorcism’ (p. 96). What are the two men exorcising? Why is this kind of behaviour considered a ritual? Have you ever been in a fight? What happened? How did you feel afterwards? What was the fight about? Research police powers of arrest. How would it feel to be arrested? If you are arrested, what are your rights? Of all the characters in the play, who do you feel sorry for at the end? Why? What are some of the responsibilities that come with a position of power? Think of people in such positions – school principals, policemen, doctors, sports’ coaches. Does Simmonds abuse the position he’s in? If so, how/why? Sum up the core message of this play to its audience in one sentence. At the end of the play, do you feel sorry for Kenny? Is his treatment at the hands of the policemen justified, given his violence towards Fiona? Why does Ross ‘snap’ at the end, attack Kenny, and then fight with Simmonds? Do you judge Kate for her infidelity? If so, why? If not, why not? Are any of the characters in this play hypocritical? Who and why? Summarise the plot of this play in about 200 words. What happens, to whom? Create a visual representation of the play’s plot – introduction, exposition, rising action, conflict, double ending, resolution. An example – ‘Removalists Plot Sequence’ – (PDF, 177KB) has been provided. This will also be useful in discussing the play’s structure, in the next phase of this Unit. Use these statements to track how each character changes throughout the play. Choose the character who you think changes the most, and explain why. Refer to the character web you created earlier. Use at least one quote from the play as evidence of your chosen theme. You have been asked to design the set for a new production of this play. You only have one space to work with and so you have to incorporate both locations and represent at least three of the themes dot-pointed above. Include two views of the design, a bird’s-eye view and a front-on view, and provide notes explaining your set’s major features and ideas. Are there any likeable characters in this play? Discuss in one page with reference to specific events in the plot and quote dialogue as evidence for your assertions. The Removalists is reasonably conventional in terms of dramatic convention. It has two acts and the action takes place in real time, i.e. there are no flashbacks or time lapses. The events of the play unfold over the course of one day. Why has Williamson chosen the two-act structure, where some plays have three acts, or five (as Shakespeare preferred)? Consider the plot of the play as a clue here. Students might refer to the graphic organiser they created of the play’s plot. Where is the Act Break on this continuum? Students should consider whether or not they think the play has a satisfactory resolution. It is certainly not a fairy-tale ‘happy ending’; why has Williamson chosen to end the play this way? Dramatic convention dictates that characters are created through their dialogue and their interactions with other characters. Reread the opening pages of the play, up to page 35 (‘ROSS: I don’t think that at all.’) Cast students in the two roles. Consider the personalities of each character as they begin to emerge in this section. Brainstorm a list of words to describe Simmonds. Does he remind you of anyone you know? Do the same with Ross. Then brainstorm a list of words that describes their relationship. Again, how does this emerge through the dialogue? Find specific lines of dialogue that illustrate the personality of these characters. Repeat this task for the opening pages of Act Two with Kenny and Fiona, and if time allows, with a section of the script that illustrates the relationship between Fiona and Kate. (Suggest pages 40 to 48). If you explore this section, you may also be able to add words (such as ‘lecherous’ or ‘pervy’ for Simmonds) to other lists. Because The Removalists belongs in the theatrical genre of social realism (sometimes referred to as ‘slice of life’ or ‘kitchen sink’ drama), both settings in the play are taken from reality – a small suburban police station and Kenny and Fiona’s flat. The play is set in Melbourne; some students may be familiar with specific locations that are mentioned. Williamson describes the police station in which Ross and Simmonds work, where the action of Act One takes place, as having ‘an air of decrepit inefficiency’. What do you think this means? How does this align with, for example, the character of Simmonds? The real-life settings of this play might resonate with viewers and therefore enhance the dramatic impact of the play. Identify and discuss in two or three paragraphs why using familiar locations could achieve this. Consider the characters of Kenny and Ross. Arguably these are the two characters who undergo the most dramatic transformation during the play, in very different ways. Reconsider the earlier question about whether assaulting Kenny is justifiable, given his blatant sexism and chauvinistic attitude towards Fiona. What is the significance of Ross, the fresh-faced naïve recruit from the opening pages of Act One, delivering the fatal blows? Create a Venn diagram for Ross, with one sphere representing Act One and one representing Act Two; in the middle include words or moments from the play when Ross begins to change and come (arguably) under Simmonds’ power. Create a similar diagram for Kate and Fiona and consider the ways in which they contrast one another despite (or perhaps because) they are sisters. The Removalists is a play that deals with realistic characters in a plausible, if contrived, situation. The bare bones of the play’s story were inspired by an anecdote told to Williamson while he was moving, by The Removalist. As a result, the dialogue is natural and drawn from everyday common language. It is used to exert power (Simmonds) and to manipulate (Kate). Find examples of this in the script and record them. The play also features some lovely Australian idioms – ‘Stuff the rule book up your arse,’ Simmonds tells Ross early in Act One. There are references to ‘love pats’ (somewhat ironic), ‘tubes’ (as in cans of beer), and several instances of sarcasm, especially from Kenny: ‘Television. It’s a new electronic wonder that’s just filtered down to the lower classes. Keeps their brains nice and soggy.’ (p. 55) There are also countless uses of Australian vernacular: piss off, bloody, bugger, etc. There are also deliberate elements of humour and comedy at work in the play, especially in Act Two when Simmonds, Ross and the The Removalist turn up without Kenny’s knowledge to move the furniture out. Class Discussion: In a play that deals with fairly serious themes and situations, what is the role of humour? Why do you think Kenny manages to be sarcastic in spite of the situation he’s in? Do some research to see whether anti-Vietnam War protests were still being held in the early 1970s. They were certainly held across the country during the late 1960s. Could this be one reason why police brutality was on the radar as an issue worth exploring? In an interview for the 2014 Brisbane Powerhouse production of the play, David Williamson mentions that the play still resonates today in part because there has been no real improvement (or decline) in statistics relating to domestic violence. Can you suggest some reasons for this? The Removalists presents a somewhat singular view of what it means to be male; suggesting that violence is never far from the surface and that men are easily influenced by lust, for example. Is this a stereotype? Students should consider five men you know, of different ages. Do these men remind students of any of the male characters in this play? Discuss with students whether The Removalists‘ depiction of male behaviour remains relevant in 2015. Your theatre company is applying for funding to stage a production of The Removalists. Write a two-minute speech justifying your choice of this production, highlighting the play’s most significant features and the relevance you think it might have for a contemporary audience. The rest of the class represents the funding body and you must convince them to fund your production. The ‘default’ reading of the play is masculine, since male behaviour is one of its central issues. It’s worth noting where shifts in power occur during the play – between Simmonds/Ross, Kate/Fiona and between Kenny/Fiona. A moral reading of the play is also worthwhile. Is Simmonds completely amoral? If so, is this vindicated at all by him simply being a product of his time? Direct students to rank the characters in terms of their moral ‘value’. Who is the most moral, and who is the least? Why do students think so? A film version of the play was made in 1975 and is available on YouTube. A revival of the play was staged in 2014 by Brisbane Powerhouse. Teachers’ notes are available and these contain some interesting insights into the play, and a link to a short interview with David Williamson. They are otherwise geared towards Drama students, but some of the acting exercises might allow students to gain further insight into the characters and situations in the play. YouTube clip of two very capable young actors presenting the opening scene of Act Two. 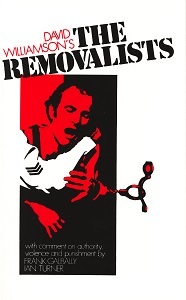 The Removalists continues a social realist tradition in theatre that commenced in England in the 1950s with plays as John Osborne’s seminal Look Back in Anger with its archetypal ‘angry young man’ character, an archetype also portrayed on screen by actors such as James Dean, and Marlon Brando in The Wild One. Sometimes referred to as ‘kitchen sink’ dramas, this genre explores social issues and uses realistic situations to reflect perceived problems in society back on itself. Who is the ‘angry young man’ in The Removalists? Play students the Paul Kelly song To Her Door and direct them to the lyrics. What themes do this song and The Removalists have in common? Read Geoff Goodfellow’s poem The Violence of Work. Goodfellow is a strong poet whose work deals with the lives of working class Australians – represented in The Removalists by Kenny. Consider the structure and repetition used in this poem to illustrate the repressions and rhythms of a working class life. Arguably, the explosion of locally produced theatre and film in the 1970s ended what had been referred to as ‘the cultural cringe’. By using Australian vernacular and presenting situations or locations that Australian audiences could readily identify with (and perhaps be confronted by), plays like this one established a framework of artistic expression which valued Australian voices and stories. Violence, for whatever reason, seems to be an ingrained part of our culture: from sports such as ARL and AFL to recent incidents of ‘one-punch’ attacks. The Removalists uses a tragic story to touch on universal themes of love and loss, power, authority and violence. While the context of the play is specifically Australian, many of its ideas and themes transcend geographical borders. Choose one of the characters in the play, and perhaps revisit that character’s dialogue and role within the action of the play, their attitudes to others and how these change etc. Write a monologue of 2-3 minutes’ duration (approximately 1000 words). If you choose Kenny, the monologue should be set prior to the beginning of Act Two – perhaps what he is thinking as he is walking home. For all other characters the monologue should be set after the conclusion of the play. What is your character’s attitude/response to the events of the play? What have you learned? What will happen next for you? These are guiding questions only – use them to formulate a first draft and develop/refine your ideas from there. An assessment rubric for this task is included (PDF, 227KB). Socio-Cultural: Is Australian society violent in its essence? Political: Do our forces of law and order rest on violence? Psychological: Are there shades of Simmonds, Ross or Kenny in all of us? There are very interesting conversations to be had about these in light of recent media coverage over ‘one punch’ attacks and/or gang violence in our major cities. There are even connections to be made with the recent Lindt Café siege in Sydney, given recent revelations that one of the hostages may have been killed by a police bullet. Arguably, the hallmark of a classic and enduring piece of writing is that it allows us to explore issues such as these over forty years after it was written. graphs drawn from a survey of students relating to attitudes governing conflict resolution, bullying, police brutality, divorce or violence in society (for example). Visual components should be presented to the class with a 2 to 3 minute prepared explanatory speech and an opportunity for questions. See the attached rubric (PDF, 173KB) for an approach to assessing this task. Unit Suitable For AC: Year 10 (NSW Stage 5) with possible extension into Years 11–12. Duration Four to six weeks (depending on time allocation). CAMERON HINDRUM lives, writes and works in Launceston, Tasmania. HIs novel, The Blue Cathedral, was published in 2011 and two collections of poetry, Private Conversations Volumes 1 & 2, appeared the following year. He is currently working on a doctorate in Creative Writing through the University of Wollongong and a script commission for Mudlark Theatrere, developing a play set on Tasmania’s west coast. He teaches English to teenagers, grows vegetables and occasionally performs in local theatre.